With just 4 days remaining to XAT, XAT General Knowledge question bank should be a part and parcel of each and every student’s library who is serious about XAT GK preparation. It would take hardly one hour to go through these 50 questions on XAT GK. 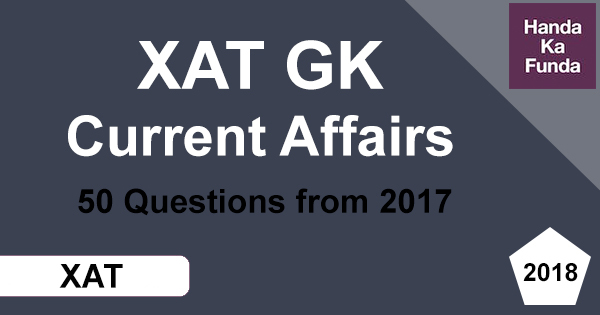 I would strongly recommend all the XAT GK students to please go through these 50 questions in detail and revise them once before the exam. 1. ISRO in February 2017 broke a world record by sending how many satellites into the orbit in a single mission? 2. Which team won the FIFA U-17 World Cup held in India? 3. The official mascot of FIFA U-17 World Cup was ____________. 4. Who among the following has been appointed as the new Finance Secretary? 6. What is India’s rank on the World Bank’s ease of doing business Index? 7. Whom has U.S. President Donald Trump nominated to be the next US Ambassador to India? 8. Who among the following is going to lead the Multi-Agency Group to investigate cases relating to ‘Paradise Papers’ data leak? 9. Which city was the host to the 2017 United Nation Climate Change Conference (COP23)? 10. Which was the first country to implement Good and Services Tax (GST)? 11. Who among the following won the 2017 Miss Universe crown? 12. Which is the only country in the world that has declined to be a part of the Paris climate agreement? 13. Prior to becoming the chairman of Tata Sons, N Chandrasekaran served as the CEO of which company? 14. Which is the first country to partner with Facebook on disaster response? 15. Name the company that has launched ‘Inbox’, an instant messaging service. 16. Who among the following will head the probe into Jayalalithaa’s death? 17. In order to restrict the illegal immigration in the United States, President Donald Trump has decided to build a wall along the border of which country? 18. Which Scandinavian country has become the first country in the world to switch off the FM radio? 19. Which city has been declared as the second capital of Himachal Pradesh? 20. According to the Collins dictionary the 2017 Word of the year is? 21. Who among the following has received the 2017 Jnanpith Award? 22. Who among the following will be awarded the Indira Gandhi Prize for Peace, Disarmament and Development? 23. Which neighbouring country of India has decided to build border demarcation fencing with India? 24. Name the first Sikh politician to lead a major Canadian party. He will fight Canadian Prime Minister Justin Trudeau in the next federal election. 25. Which Iconic place bagged the “Best Swachh Iconic Place” award under the Swachh Bharat Mission of the Central government? 26. Name the author who won the 2017 Man Booker Prize? 28. Who among the following has become the first batsman in the history of Test Cricket to have scored a century in 11 different countries? 29. Which among the following team was crowned the champions of Pro Kabaddi League 2017? 30. The multilateral exercise ‘Blue Flag 17’ was carried about between India and which other country? 31. Who among the following has been appointed as the WHO’s deputy director general for programmes? 32. Which E-commerce giant has decided to sponsor next 6 Olympic Games until 2028? 33. Who was the chief guest at the 68th Republic Day celebrations on 26 January 2017? 34. Who many countries will be the part of European Union post Brexit? 35. Housing.com is going to merge with which company to become the largest online real-estate firm in India? 36. Which of the following statement is incorrect about Reliance Communications? A) The company has decided to shut down its 2G business. B) Its merger with Telenor collapsed due to legal uncertainties. C) It will provide only 4G data services to its customers and will discontinue its voice services. D) The company has appointed Gurdeep Singh as the President & CEO of its Wireless Business. 37. Which state government has launched India’s largest public WiFi service? 38. Name the footballer who created history by scoring India’s first ever goal in FIFA World Cup? 39. As a part of its “VISION 2030 Plan” which Middle East nation has allowed its Women to enter into sports stadiums and drive trucks & motorbikes? 40. Which was the last Indian state to implement GST? 41. Which of the following statement/s is/are correct about GST in India? 42. Which stadium will become the first Indian stadium to have stands named after the war heroes? 43. “Mission 11 Million” was launched by the sports ministry to promote which sports among the kids in India? 44. Which state government has launched an E-Wallet named ‘Toka Poisa’ for enabling cashless transactions? 45. Which company overtook ONGC to become India’s most profitable PSU? 46. Name the Indian American who won the Oscar for Technical achievement. 47. Who became Singapore’s first female president? 48. Which two countries have teamed up to build the Moon’s First Space Station? 49. Name the 1st country that President Ram Nath Kovind visited during his first overseas trip? 50. Apart from India, US and Japan which other country participated in this year’s Malabar naval exercise? Explanation: ISRO in Feb 17 launched 104 satellites, on a single rocket from the spaceport in Sriharikota. The satellites were launched using PSLV-C37. Of the 104 satellites, 101 satellites were from international clients. Explanation: England won the FIFA U-17 World Cup by defeating Spain 5-2 in the finals. The tournament marked the first time India have hosted a FIFA tournament. Explanation: A clouded leopard called Kheleo was the official mascot of FIFA U-17 World Cup. Explanation: The appointments committee of the cabinet named the revenue secretary Hasmukh Adhia as the new finance secretary. He took over from Ashok Lavasa. Adhia is one of the driving forces behind goods and services tax. Explanation: India jumped up 30 notches to 100th position in the latest rankings on the World Bank’s ease of doing business index. India is among the top ten improvers this year, with improved ranking in six of the ten indicators. The list was topped by New Zealand followed by Singapore. Explanation: U.S. President Donald Trump has nominated Kenneth Juster to be the next US Ambassador to India. Juster replaces Indian-American Richard Verma as the top American diplomat to India. Explanation: The government of India has constituted a multi-agency group to investigate the Paradise Papers cases which will be headed by CBDT Chairman Sushil Chandra. The multi-agency group is already investigating the “Panama Papers”. Explanation: The 2017 UN Climate Conference took place in Bonn, Germany, from 6-18 November and was presided over by the Government of Fiji. The next UN Climate Conference will be held in Katowice, Poland. Explanation: France was the first country to implement the GST in 1954. More than 140 countries have implemented GST. India has adopted the Canadian model of dual GST as it has a federal structure where the Centre and states have the powers to levy and collect taxes. Explanation: Demi-Leigh Nel-Peters, who represented South Africa, won the Miss Universe crown while India’s Manushi Chhillar won the coveted Miss World 2017 crown. Explanation: United States in the only country in the world that is not a part of Paris Climate agreement. The last country to sign the Paris agreement on climate change was Syria. Total 197 nations have signed up to the landmark pact on global warming. Explanation: Natarajan Chandrasekaran, CEO of Tata Consultancy Services was appointed as the executive chairman of Tata Sons. He was the CEO and managing director of TCS since 2009. Chandrasekaran is only the third non-Tata after Nowroji Saklatwala and Cyrus Mistry to be named Tata Sons chairman. Explanation: India is the first country to partner with Facebook on disaster response. The partnership is aimed at providing quick response and information to people in times of need. Explanation – To take on WhatsApp, India’s largest digital wallet app, Paytm has launched ‘Inbox’ that enables users to chat with friends and family as well as send and request money. Explanation: The Tamil Nadu government has constituted an inquiry commission, which will be headed by retired high court judge, to probe the death of former chief minister of Tamil Nadu J Jayalalithaa. Explanation: United States will a build a wall along the Mexico border to restrict the illegal immigration. The border is about 3,100 km long and traverses all sorts of terrain. President Trump has always insisted that Mexico will pay for building this wall. Explanation: Norway has become the first country in the world to shut down national broadcasts on its FM radio network. From now on all the state broadcaster’s radio programmes can only be heard via Digital Audio Broadcasting (DAB). Explanation: The Himachal Pradesh Cabinet has declared Dharamshala as the state’s second Capital. The second capital of Himachal will not be following Dardar practice followed in Jammu and Kashmir. Explanation: Fake news, a term popularised by U.S. President Donald Trump, has been named the word of the year by Collins dictionary due to its widespread use around the world. According to the oxford dictionary the word of the year is ‘Youthquake’. Explanation: Renowned Hindi litterateur Krishna Sobti has been chosen for this year’s Jnanpith Award. She is known for experimenting with new writing styles and creating “bold” and “daring” characters in her stories. Explanation: Former Prime Minister Dr. Manmohan Singh has been chosen as the recipient of this year’s Indira Gandhi Prize for Peace, Disarmament and Development. Singh was recognised for the leadership he provided to the country and for his achievements during the “momentous” ten years between 2004 and 2014, when he served as Prime Minister. Explanation: Myanmar has decided to build border demarcation fencing with India in its Naga self-administered zone, 10 metres from the demarcation border line. The construction will however not restrict the regular travel of both the peoples in accordance with their tradition and custom. Explanation: Jagmeet Singh has become the first person belonging to a visible minority group to be elected as the leader of one of Canada’s three largest national political parties. He will captain the NDP in the next federal election to be held in October 2019. Explanation: Meenakshi Sundareswarar Temple in Madurai has been ranked the cleanest iconic place in the country. Meenakshi Temple is a historic Hindu temple located on the southern bank of the Vaigai River in the temple city of Madurai. The temple forms the heart and lifeline of the 2,500-year-old city of Madurai. Explanation: American author George Saunders won the 2017 Man Booker Prize for his novel “Lincoln in the Bardo”. He is the second consecutive American writer to win the prize after Paul Beatty. Explanation: Younis Khan is the first player in the history of Test cricket to have scored centuries in 11 countries, including the UAE which is currently Pakistan’s home venue for international matches. Rahul Dravid is the only other cricketer to have scored centuries in all 10 full-member Test nations. Explanation: Patna Pirates were crowned the champions for the third time in a row as they crushed Gujarat Fortunegiants in the finals 55-38 to win the Pro Kabaddi Season 5. Explanation: The ‘Blue Flag 17’ multilateral exercise was carried out between India and Israel at Uvda Air Force Base in Israel with an aim to strengthen the military cooperation amongst the two nations. Explanation: Dr Soumya Swaminathan, director general of the Indian Council of Medical Research has been appointed the deputy director general for programmes (DDP) of World Health Organisation. She is a pediatrician by speciality, has more than 30 years of experience in clinical care and research. Explanation: Alibaba has inked a deal with the International Olympic Committee to sponsor the next six Olympic Games. Alibaba will also provide technology services to the games organisers, and will establish the Olympic Channel. Explanation: Crown Prince of Abu Dhabi Mohammed bin Zayed Al Nahyan was the chief guest at the 68th Republic Day parade this year. India has invited the heads of all 10 ASEAN nations for next year’s Republic Day parade. Explanation: Post Brexit 27 countries will be the member of European Union. Currently the European Union is a political and economic union of 28 member states. The headquarters of EU is in Brussels, Belgium. Explanation: Housing.com will merge with PropTiger.com to form India’s largest online real estate services company. Dhruv Agarwala, co-founder of PropTiger will serve as CEO of the joint entity. Explanation: The proposed merger between RCom and Aircel was called off due to legal uncertainties. The merger between the two companies would have resulted in the formation of 4th largest telecom firm. Explanation: Maharashtra government has launched ‘MumbaiWifi’, India’s largest public Wifi service with aim to empower people digitally. The facility will initially provide 500 Wifi hotspots across various locations in Maharashtra. Explanation: Jeakson Singh is first Indian to score a goal in FIFA World Cup competition. He scored the goal against Colombia, India lost that match 1-2. Amarjit Singh was the captain of the U17 team while Luis Norton de Matos was the coach of the team. Explanation: As a part of Saudi Arabia’s Vision 2030 plan to diversify its economy, the kingdom has allowed women to enter into sports stadiums and drive cars, trucks and motorbikes. Explanation: Jammu and Kashmir was the last state to implement GST while Assam was the first state to ratify GST Bill. Explanation: Good and Services Tax (GST) is an indirect tax which was introduced in India on July 1, 2017 using the 122nd Amendment of Indian Constitution. India has chosen the Canadian model of dual GST as it has a federal structure where the Centre and states have the powers to levy and collect taxes. The head of GST Council is Union Finance Minister Arun Jaitley. The Tax slabs under GST are 5%, 12%, 18% and 28%. Explanation: Eden Gardens stadium at Kolkata is the first Indian stadium to have stands named after the war heroes. Two stands will be dedicated to the brave soldiers. Explanation: “Mission 11 Million” was launched to engage more than 11 million children in activities relating to Football. Explanation: The E-wallet ‘Toka Poisa’ has been launched by Assam State government. With this e-wallet, Assam is the first state in eastern India to have its own e-wallet. So far, only Andhra Pradesh and Maharashtra have their own e-wallets. Explanation: Indian Oil Corp overtook Oil and Natural Gas Corp (ONGC) to become India’s most profitable state-owned company. IOC posted a 70% jump in net profit to Rs 19,106.40 crore. Reliance Industries retained the crown of being India’s most profitable company. Explanation: Parag Havaldar, a computer engineer from IIT Kharagpur won the Oscar for Technical achievement. The technology developed by him and his group has been used to create stylised and realistic character animations in movies such as Alice in Wonderland, Hancock and Spiderman. Explanation: Halimah Yacob, a former speaker of parliament from the Muslim Malay minority became Singapore’s first female president after a “walkover” election that saw no vote after no other contenders ran for the position. Explanation: Russia and the U.S. have agreed to work together on building the moon’s first space station. Explanation: President Ram Nath Kovind visited to Djibouti followed by Ethiopia during his maiden trip abroad since taking the office. Djibouti is the country where China has opened its first Overseas Military Base. Explanation: Malabar is a trilateral naval exercise involving the United States, Japan and India as permanent partners. Navies of Australia and Singapore also participate in this exercise time to time. I felt the questions and answers should have been together here as this is not some practice but just revision. It was pain scrolling down for the answer of each question.